Syracuse University senior Sean Foote is working to create a better world for his 3-year-old son. The engineering major cares about the environment and wants to help preserve it for his son’s future enjoyment. This is mainly why Foote got involved with the U.S. Green Building Council (USGBC) Students group at Syracuse University. As the group’s treasurer, he’s helping to lead USGBC Students in educating others both on and off campus to take action on sustainability. As an affiliate of the USGBC’s Center for Green Schools, the SU chapter of USGBC Students leans heavily toward educating others on green buildings and sustainable design. This was evident in the group’s first service project last fall. 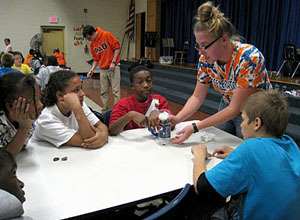 Foote and several other group members gave students at H.W. Smith School in Syracuse a hands-on introduction to hydroponics. USGBC Students was launched two years ago and was recognized by the Division of Student Affairs as a student organization last spring. It currently has about 20 active members, and membership has been increasing. A major focus of USGBC Students is offering various resources on the USGBC’s Leadership in Energy and Environmental Design (LEED) program. This includes access to local field trips, webinars, courses and study materials for LEED accreditation exams. The group recently toured the renovated LEED Platinum Hotel Skyler, located a few blocks north of Main Campus, and held a study session for students interested in taking the LEED Green Associate accreditation exam. Earlier this month, several members attended the New York State Green Building Conference in Syracuse. The USGBC Students group at SU will hold its next monthly meeting Thursday, March 28, at 7 p.m. in the Hall of Languages, Room 111. Anyone wanting to get involved in educating others about sustainability and green buildings is welcome to attend. Membership in USGBC Students is open to all SU and SUNY-ESF students interested in environmentally sustainable design, construction and building operations regardless of declared major or primary area of study. For more information about USGBC Students, visit its Facebook page at www.facebook.com/SUUSGBC or email suusgbc@gmail.com.